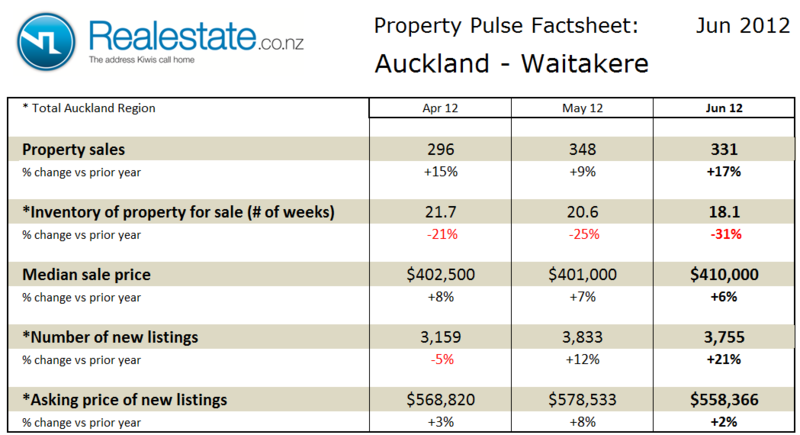 The Waikato region property pulse factsheet for June 2012 is published using data from Realestate.co.nz and REINZ (Real Estate Institute of NZ). 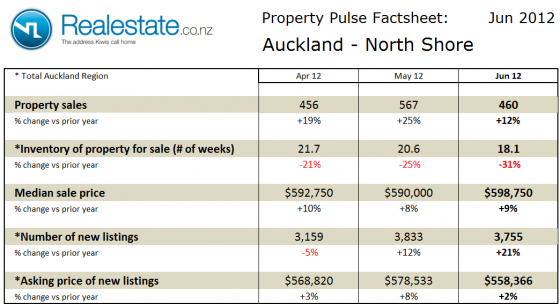 Property sales in the Waikato region at 396 in the month rose on a seasonally adjusted basis in June and was up 19% as compared to a year ago. The inventory of unsold houses fell to 37 weeks having risen slightly in May this still sees inventory remaining below the long-term average of 49 weeks of equivalent sales. 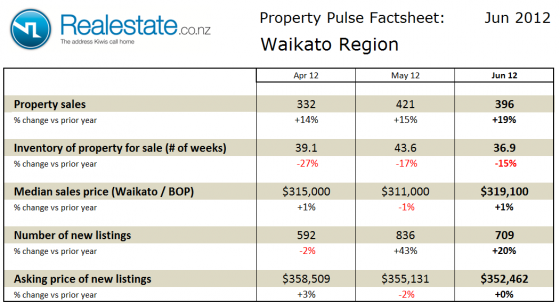 Median sales price for properties sold across the whole of the Waikato / Bay of Plenty region at $319,100 was up 1% as compared to a year ago and up on the prior month. The asking price expectation of new listings remained fairly flat as compared to a year ago at $352,462. 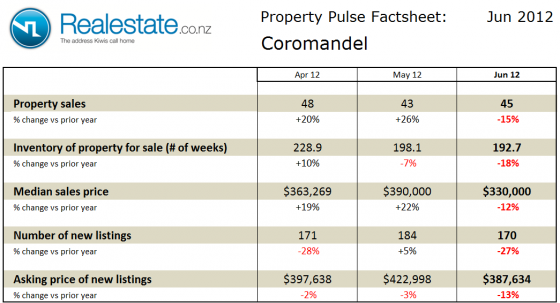 The level of new listings coming onto the market across the Waikato region in June at 709 was up 20% as compared to a year ago, but down as compared to May. The Bay of Plenty region property pulse factsheet for June 2012 is published using data from Realestate.co.nz and REINZ (Real Estate Institute of NZ). 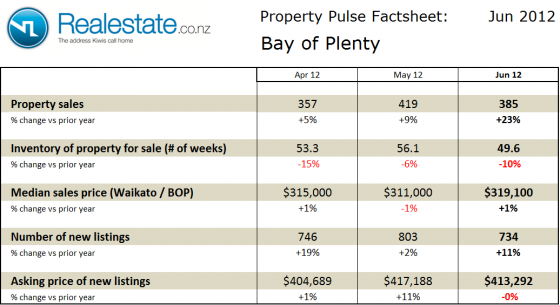 Property sales across the Bay of Plenty region at 385 in the month rose on a seasonally adjusted basis in June, and was up a significant 23% as compared to a year ago. The inventory of unsold houses fell to 50 weeks; this still leaves the region slightly below the long-term average of 57 weeks of equivalent sales. 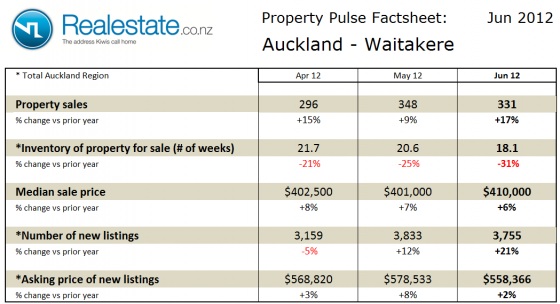 Median sales price for properties sold across the whole of the Waikato / Bay of Plenty region at $319,100 was up 1% as compared to a year ago and up on the prior month. 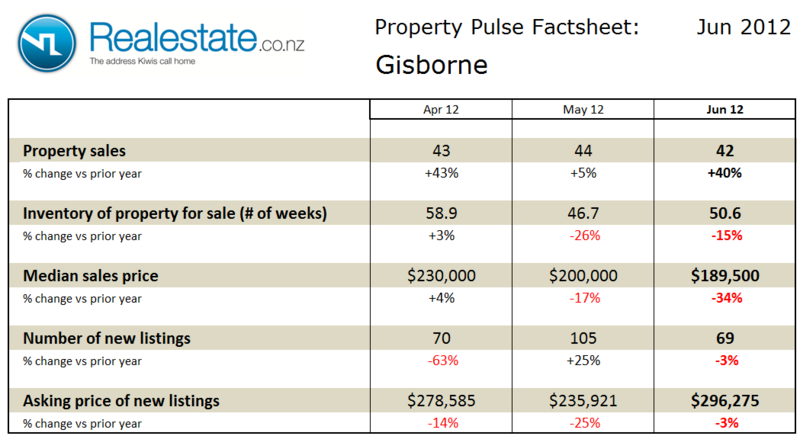 The asking price expectation of new listings in the Bay of Plenty was flat as compared to a year ago at $413,292. The level of new listings coming onto the market in June at 734 was down from May and up 11% as compared to a year ago. 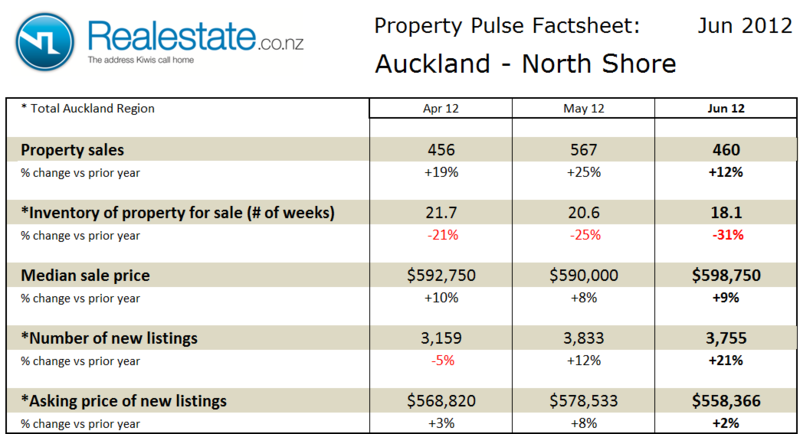 The Central North Island region property pulse factsheet for June 2012 is published using data from Realestate.co.nz and REINZ (Real Estate Institute of NZ). 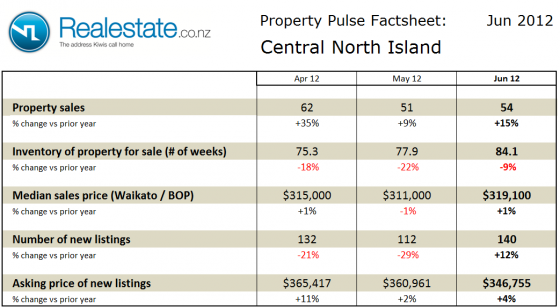 Property sales across the Central North Island region at 54 in the month showed a rise on a seasonally adjusted basis in June but was up 15% as compared to a year ago. 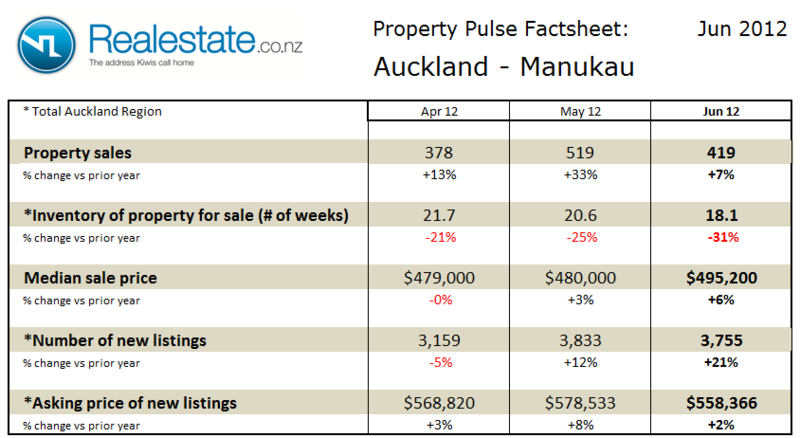 The inventory of unsold houses rose to 84 weeks to sit just over the long-term average of 81 weeks of equivalent sales. Median sales price for properties sold across the whole of the Waikato / Bay of Plenty region at $319,100 was up 1% as compared to a year ago and up on the prior month. 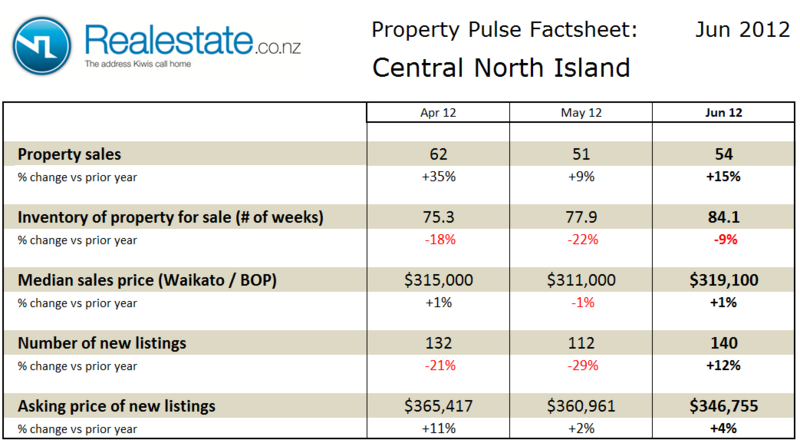 The asking price expectation of new listings in the Central North Island was up 4% as compared to a year ago at $346,755. 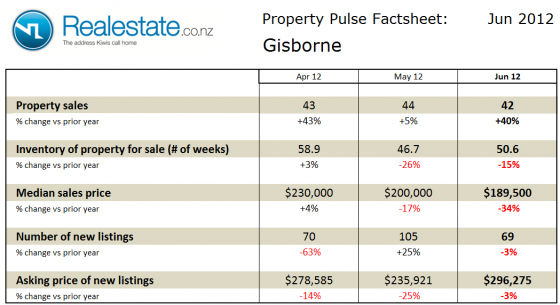 The level of new listings coming onto the market in June at 140 was up 12% as compared to a year ago and also reflected a rise from the May level of 112. 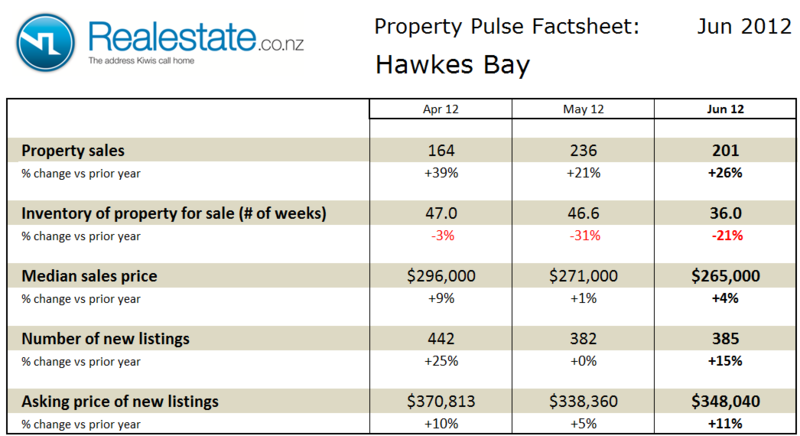 The Hawkes Bay region property pulse factsheet for June 2012 is published using data from Realestate.co.nz and REINZ (Real Estate Institute of NZ). Property sales across the Hawkes Bay region at 201 in the month represented a very slight fall on a seasonally adjusted basis in June and at the same time represented a significant 26% rise as compared to a year ago. 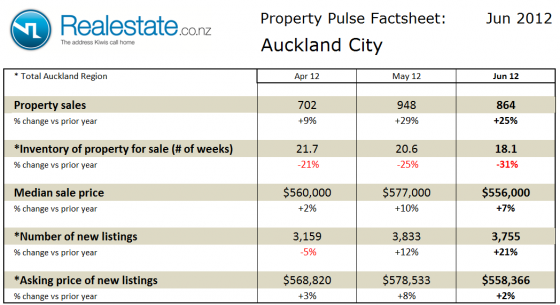 The inventory of unsold houses on the market fell to 36 weeks and now sits below the long-term average of 42 weeks of equivalent sales. 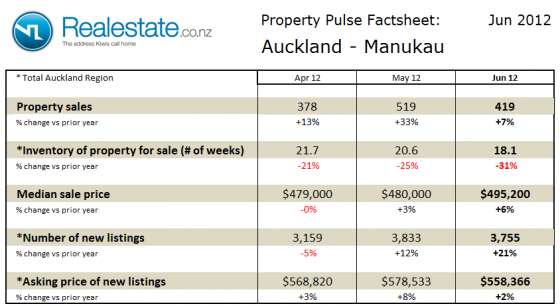 Median sales price of properties sold in the Hawkes Bay at $265,000 was up 4% as compared to a year ago and down very slightly from the prior month. The asking price expectation of new listings was up 11% as compared to a year ago at $348,040. The level of new listings coming onto the market in June at 385 was marginally up from prior month and represented a 15% increase as compared to a year ago.